Home Amnesty What’s Up? Illegal Immigration. Now Guess What’s Down. DHS admits illegal immigration was up in 2014 (how could they not admit it?) and that deportations dropped. If we turned over deportations to private contractors we’d have this mess sorted out in 18 months. If ICE only deported 15,000 when they were funded to remove 400,000, the good news is that these are the same elitists who clamor to confiscate Americans’ firearms. Good luck with that! 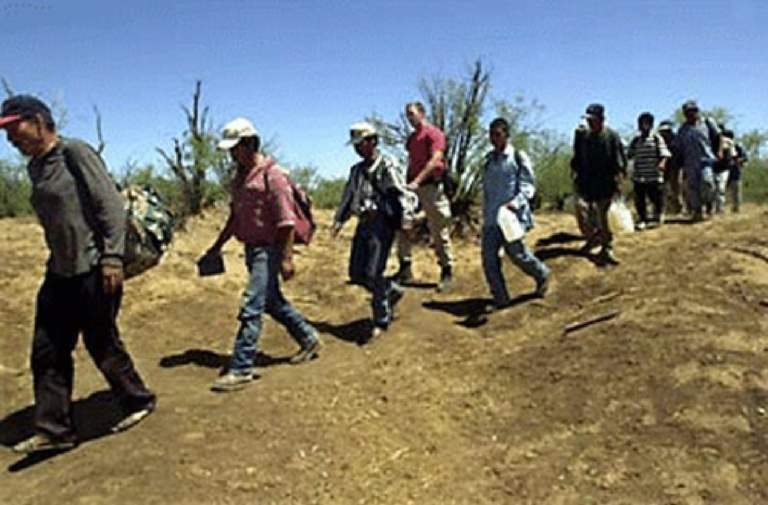 The number of illegal immigrants crossing the border rose in 2014, while deportations dropped, according to new statistics Homeland Security released Friday in a pre-holiday data dump that signaled potential problems on both sides of the immigration enforcement equation. Apprehensions on the border, which Homeland Security Secretary Jeh Johnson says is a yardstick for overall illegal immigration, rose 16 percent in fiscal year 2014, while deportations from within the interior of the U.S. — the measure of how much the administration is going after long-time illegal immigrants — fell 24 percent. Those numbers, which cover from Oct. 1, 2013, through Sept. 30, 2014, are from before President Obama announced his new temporary amnesty on Nov. 20. That is likely to lower deportations even more. An administration official briefing reporters on condition he not be named said the drop in deportations was at least partially due to the surge of illegal immigrants from Central America, who he said require detention, flights and travel documents, which makes them more expensive to deport than Mexicans, who can usually be quickly sent back across the land border. The official also said part of the problem is that so-called “sanctuary city” localities are increasingly refusing to turn immigrants over to federal authorities for deportation. Homeland Security said localities refused 10,182 different requests from federal agents to hold illegal immigrants the agents wanted to pick up for deportation. The grim numbers are likely to inflame opposition on Capitol Hill to Mr. Obama’s amnesty, which congressional Republicans predict will lead to a new surge of illegal immigration. Mr. Obama himself had predicted the same thing several years ago, but his homeland security officials now dispute that, saying they believe they can prevent a new surge of illegal immigration while no longer deporting most rank-and-file illegal immigrants. Mr. Johnson, in a statement releasing the figures, blamed this summer’s surge of illegal immigrant children for the poor results. “This year’s statistics are informed by a number of complex and shifting factors, most notably the 68 percent increase in migration from countries other than Mexico, predominately from Central America, and a 14 percent drop in Mexican migration since fiscal year 2013,” he said. An administration official said this is the first time on record that border authorities have caught more non-Mexicans than Mexicans at the border, underscoring the changing demographics. As for deportations, the administration said of the roughly 102,000 immigrants deported from the interior of the U.S., about 87,000 had criminal records. That means only about 15,000 rank-and-file illegal immigrants with no criminal records were deported, which works out to about 1 out of every 1,000 illegal immigrants estimated to be in the U.S.
Mr. Obama has pushed for those numbers, saying he felt he was deporting too many illegal immigrants with families here, or ties to their community. While pushing for more deportations, he had asked that his agents focus those efforts on criminals and on illegal immigrants who had just recently crossed the border. Under the president’s new priorities laid out last month, agents are told to focus their deportation efforts on illegal immigrants with criminal records or those who arrived after Dec. 31, 2013.
deportation, homeland security, illegal immigrants, immigration, obama, politics. Bookmark.